Hydramethylnon is an organic chemical compound. It is also known as AC 217,300. 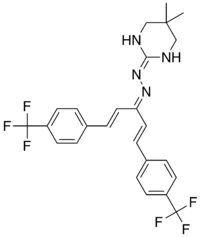 It is in a chemical class called trifluoromethyl aminohydrazone, which is a metabolic inhibitor. It is classified as a pesticide designed to control insects that are harmful to man. It works by inhibiting complex III in the mitochondrial inner membrane and leads to a halting of oxidative phosphorylation. It is used primarily as an insecticide in the form of baits for cockroaches and ants. Some brands of insecticides that include hydramethylnon are Amdro, Combat, Blatex, Cyaforce, Cyclon, Faslane, Grant's, Impact, Matox, Maxforce, Pyramdron, Siege, and Wipeout. Oral, rat: LD50 is 1100–1300 mg/kg. Oral, dog: LD50 is above 28000 mg/kg. Hydramethylnon is especially toxic to fish; the 96-hour LC50 in rainbow trout is 0.16 mg/L, 0.10 mg/L in channel catfish, and 1.70 mg/L in bluegill sunfish. Hydramethylnon is known to cause cancer in rats, particularly uterine and adrenal tumors and lung cancer. Fipronil, another insecticide used for similar purposes. This article is issued from Wikipedia - version of the 1/29/2016. The text is available under the Creative Commons Attribution/Share Alike but additional terms may apply for the media files.